Blue has long been known for excellent USB microphones—namely the Yeti and its younger brother the Snowball, both of which function intuitively for people outside the audiophile community, while providing dependable recordings with little fuss. That attention to detail has been shrunken down even further with the new, $200 Raspberry. But what need does it fill exactly? The Raspberry works with USB or lightning, meaning it can be plugged directly into an iPhone. At about 4.5 inches long and 1.5 inches square it’s not quite pocket-sized, but it has the potential to be the most painless-to-use portable beginner mic. According to Blue, the Raspberry is about capturing audio outside the desktop environment and is, “ideal for podcasts, on-location interviews, live streams, voice-overs, audio for YouTube, and music.” So lets address those use cases. In spite of a robust, highly portable design, the Raspberry is not a hand-held mic. Sure, it fits in your hand, but I found that moving it around creates quite a bit of rattling in recordings that—for a company largely aimed at taking work out of recording—would require quite a lot of editing to strip out. Other Blue microphones allow you to select a specific polar pattern that determines how focused their “hearing” is, and the Raspberry doesn’t. So it’s forced to split the difference, and it can’t quite capture everything you need. For example, it’s not a focused-enough to capture an interview in a noisy environment. Sound transfer from movement rules out its viability for field recordings as well. Tracking music with an iPhone and the lightning-ready Raspberry is theoretically possible with the right software. I’d vastly prefer the comfort of a laptop. (Again, a somewhat less portable option.) In testing the Raspberry against Blue’s equally-priced (non-USB) Spark, the Spark won by a mile, with greater clarity and noticeably less noise. Of course, the Spark requires additional gear to convert its signal to digital, so it’s not an exactly equivalent comparison, but I would trust the Spark (and have!) for tracking demos. The Raspberry seems better suited for jotting down ideas where the on-board iPhone mic would do. After all, it’s less about sound quality and more about don’t-forget-how-this part-goes-until-you -can-record-it-for-real in those sorts of cases. As for podcasts, streams, and VO, those are all mainly desktop activities, which defeats the Raspberry’s stated purpose somewhat. The Raspberry sounds much, much better than any mic its size that I’ve tested, but it’s also markedly more expensive than the Yeti which remains our top pick for USB podcasting microphones. The Yeti sounds better and has more robust features, like variable polar patterns. We can all appreciate what Blue has done for democratizing recording here—and like its other products, the Raspberry is beautifully designed. The stand folds nicely into the body (which feels like it can take a few drops) for maximum portability, it’s USB or lightning compatible, and provides great sound for its size. I’m just stuck wondering who needs it. Field recordists and interviewers would be better served by a Zoom (or similar digital recorder) and shotgun mic with the tight polar pattern the Raspberry lacks. Podcasters and streamers already favor the Yeti and the Raspberry feels like a downgrade. 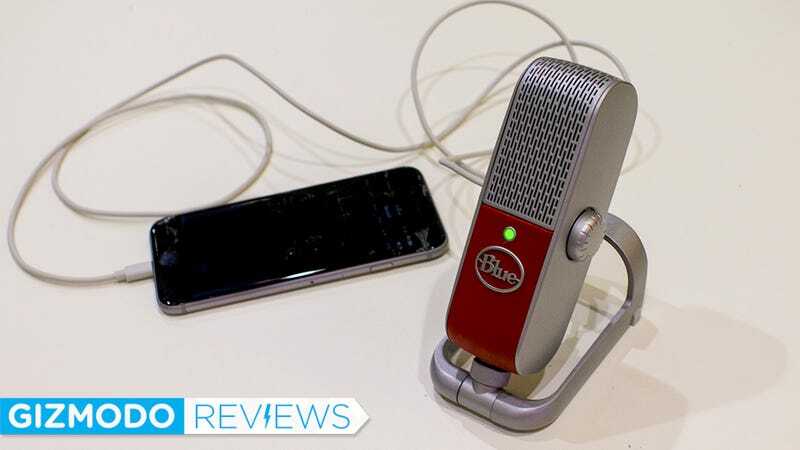 But for someone who absolutely, positively needs a go-anywhere mic with better-than-average sound quality, Blue’s little pill might just be worth the investment.